This article is about the quest. For the note, see Vald's Debt (note). Find the Quill of Gemination to clear Vald's debt to Maven Black-Briar. Talk to Maven Black-Briar about erasing Vald's debt. Find the Quill of Gemination in Lake Honrich. Bring the quill to Maven. Give the note to Vald. With hard evidence in hand, you and Karliah inform Brynjolf of Mercer Frey's nefarious deeds. Brynjolf decides that more intelligence is needed on Mercer's plans and asks you break into Riftweald Manor to see what you can find out—with impunity. Ask Brynjolf about Riftweald Manor and he will mention a "trained watchdog" guarding the house; a man named Vald that Mercer is extorting. Brynjolf suggests you speak to Vex for more on Vald. Vex has a few choice words about Vald, but will also tell you that he is working for Mercer Frey because of a debt he owes to Maven Black-Briar. Clearing the debt is suggested as one way to get Vald to stop guarding Mercer's house. To learn the details of the debt, track down Maven, who can typically be found at The Bee and Barb. She tells you that years ago she commissioned a unique quill from Winterhold. Vald was to deliver the quill to her, but he lost it at the bottom of Lake Honrich, outside of Riften. From Riften Stables, head southwest until you reach the edge of the lake. Ahead, you should see a large ship docked at Riften. Swim towards the westernmost end of that ship and look west across the lake towards Goldenglow Estate to see a similar ship docked there. Halfway to the other boat, the prow of Vald's sunken rowboat can be found at the bottom of the lake. For reference, a small island to the north will mark the halfway point. 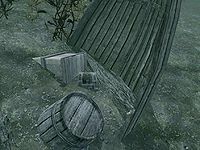 You'll see half a boat prow sticking out of the ground and the quill is located in Vald's Strongbox (leveled lock) (map). Pick it, take the quill and a leveled amount of gold, then head back to find Maven. She'll hand you a note to take to Vald. Head to the back gate of Riftweald Manor and wait there until Vald comes to talk to you. Inform him that you have erased his debt, and he will want to do you a good turn as well, giving you the key to the Manor and opening the back gate for you. The quill does not spawn until you have spoken to Maven about it, so you cannot skip this step. Even if you kill Vald, you will still have the dialogue option to erase his debt with Maven. Attempting to erase Vald's debt after he is dead will still earn you leveled gold, but you will be unable to complete the quest by delivering the letter of pardon. The quest and item will stay active. If the undelivered letter bothers you, it seems you can place it on owned bookshelves. You can also leave it on his corpse. The dialogue option to tell Vald his debt is gone appears as soon as you've picked up the quill. Turning it in to Maven is therefore optional. It's possible that Vald won't come talk to you at the gate when you bring him the note to clear his debt, becoming hostile toward you instead. This can occur if you've walked too close to the yard after the quest has started, but before erasing Vald's debt. You can also try using Pacify if he becomes hostile and you don't wish to kill him. Alternatively, approach him with your weapon out and when he attacks go into the console, click him, type setav aggression 0, exit the console, then sheathe your weapon. The following empty quest stages were omitted from the table: 0, 40, 200. On the PC, it is possible to use the console to advance through the quest by entering setstage FreeformValdDebt stage, where stage is the number of the stage you wish to complete. It is not possible to un-complete (i.e. go back) quest stages, but it is possible to clear all stages of the quest using resetquest FreeformValdDebt.